Kilkis is a Greek town and it is one of 51 prefectures of Greece. It is in the north of Greece, in the region of Macedonia. 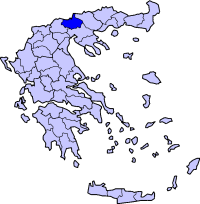 Kilkis is built on the large plain. It is an agricultural city. It has 19,247 people. This page was last changed on 16 February 2018, at 10:57.